A full day trip to an upstate apple orchard or mountain may be hard to fit into your busy schedule. What if you only have a couple of hours to enjoy the outdoors? Rye Town Park and the nearby Playland boardwalk are great places to enjoy an afternoon walk, fly a kite or take a short bike ride. A scenic walk, bike ride or day at the park may be much closer and more manageable than you thought. 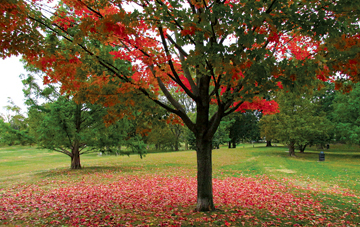 Autumn is the perfect time to enjoy the many parks Westchester has to offer. If you’re looking for a hike through nature without the mountain gear or risk of running into a bear, check out a nearby nature preserve. The Rye Nature Center, located on 47 acres of wildlife preserve, offers a number of outdoor attractions. Visitors can explore what’s left of the Parson’s Estate, a mansion from the early 1900s, or embark on one of the many scenic, but easy, hiking routes at the preserve. Parents with young kids can bring them to enjoy the nature playground and the center’s interactive museum opens Monday through Saturday. The Leatherstocking Trail is perfect for light hiking, photography, and enjoying the fall foliage from a variety of surrounding trees. The trail is accessible from either of its entrances, one in Mamaroneck and the other in New Rochelle. The path runs 2.5 miles long amidst trees and the occasional stream. It includes six acres of freshwater wetlands. For those interested in a longer walk, the Leatherstocking Trail connects to the Colonial Greenway Trail, a 15-mile trail system connecting the Town of Mamaroneck, Mamaroneck Village, Scarsdale, Eastchester and New Rochelle. As its name hints, the Colonial Greenway Trail is rich with history. Famous American figures like Ann Hutchinson, Thomas Paine and James Fenimore Cooper grew up near or passed along the trail. For those interested in a less intensive outing with abundant views, the Marshlands Conservancy in Rye is the place to go. The park offers visitors rich views of extensive salt marshes, fresh water ponds and a shoreline view along Milton Harbor. Lu Doyle, resident of Mamaroneck, enjoys visiting the conservancy. “There are three miles of trails, but it’s nearly impossible to get lost. There are great views of the sound. It’s beautiful in the fall as well as the summer and spring,” she said. The diverse wetlands makes the Marshlands Conservancy a great place to birdwatch. There is also a small aquarium exhibit inside the visitor’s center that younger kids will be sure to enjoy. Besides a visit to the Marshlands Conservancy, birdwatchers will love the Davenport Neck Bird Sanctuary in New Rochelle. Though a small sanctuary, it is home to more than 50 species of birds. For shoreline views, Manor Park in Larchmont offers a beautiful walkway along the Long Island Sound. 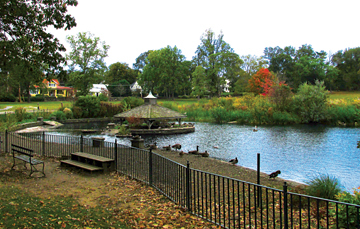 Visitors can stop and enjoy the gazebos, large striated rocks and open green spaces the 13-acre park has to offer. Larchmont resident Rosemary Ridder is a particular fan of the park. “The views of the sound are truly relaxing. Even with all the foot traffic, it never feels crowded because you can always find a place to sit and enjoy the view,” she said. Located right by the Larch-mont Harbor, Manor Park has a rich history dating back to the 1700s, when Dutch explorers first ventured across the land. Today, the park retains its rich beauty. The boardwalk next to Rye Playland offers an easy year-round beachfront walk. Conveniently located next to a large parking lot, the boardwalk is great for parents who want to bring strollers, scooters or even bikes along for the ride. Adjacent to Rye Town Park, families can continue from the boardwalk to the park. Though the whole walk or ride is under a mile, many people enjoy going back and forth a few times. For an afternoon of exploring old cannons, sculptures, stone towers and even castles, check out Glen Island Park in New Rochelle. The 105-acre park is accessible by a drawbridge built in the 1920s. Upon entering the park, visitors feel like they are in another century. June Helser, of New Rochelle, enjoys visiting the park during all seasons. 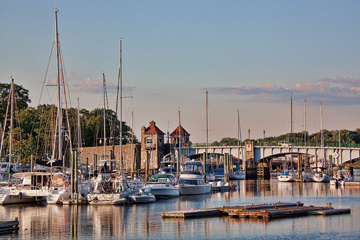 “Since I live in New Rochelle, Glen Island is a great place to visit. Great water views and a nice walking area. There is a more park-like area and a more open area. You can do a loop when walking,” Hesler said. This autumn, enjoy the waterfront views, forest trails, wildlife sanctuaries and parks Westchester has to offer. In addition to the places highlighted here, there are other parks and trails likely within minutes from you. Be sure to check out your town’s recreation site for information on visiting hours, parking and access. A great outing this season doesn’t require a long car ride or trek, so go enjoy the fall foliage and fresh air. The post Great fall excursions without the hassle appeared first on Hometown Media Group. Tags: autumn, biking, eastchester, fall, family, harrison, hiking, larchmont, mamaroneck, New Rochelle, outdoors, rye, walking, weekends, westchester. Bookmark the permalink.